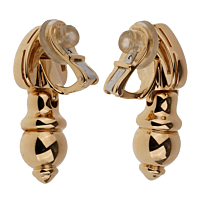 Beautiful and decadent, these vintage Bulgari drop clip-on earrings are crafted in beautiful 18k yellow gold. 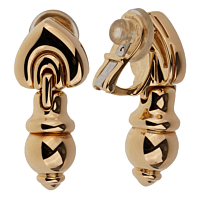 This timeless design offers a glimpse into another era with their unique drop shape and classic gold finish. These fabulous Bulgari earrings make a statement and can be the center of attention or dressed down for a more understated, yet glamorous, look.